Philip Hammond has given his clearest hint yet that he is prepared to increase spending further on the NHS. The chancellor told the BBC's Laura Kuenssberg he recognised the pressures for more spending on health, local government "and other areas". He said he would like to use any "headroom" ahead of the autumn Budget to find more cash for public services. The NHS, he said, had got an extra £9bn since 2016 but an ageing society was creating "continuous upward pressures". The BBC understands the cabinet discussed earlier this year the possibility of tax rises to fund more spending for the NHS, even the idea of a dedicated tax backed by some Conservative MPs. The BBC's political editor said she had been told by one cabinet minister that conversations were "very live" about the best way to make sure that the NHS is getting what it needs. As recently as last year's general election campaign, Theresa May maintained that the NHS had the money that it needed. But after coming under pressure from Labour and some of his own MPs, Mr Hammond found £2.8bn extra in November's Budget for the NHS in England spread over two years. However, the unions say this is just a sticking plaster after years of austerity and that the NHS, which is emerging from one of the toughest winters in recent years, needs a much larger cash injection. Pressed on the state of cabinet discussions, Mr Hammond said ministers were looking at spending needs "across the piece" ahead of the autumn Budget and a departmental spending review next year. "Of course we recognise all these pressures," he said. "It is not just the health service. There are pressures in local government and other areas but we have to do this in a balanced way". "We have put a lot more money into the NHS but of course we recognise the implications of an ageing society and an ageing population - not just for the health service but for our social care services as well." In his Spring Statement, Mr Hammond announced no new spending commitments but said there was "light at the end of the tunnel" after eight years of spending restraint focused on reducing the deficit. In the update to MPs, he said the Office for Budget Responsibility's growth forecast for 2018 had been revised marginally upwards while the watchdog said it expected public borrowing to fall every year until 2021-22. 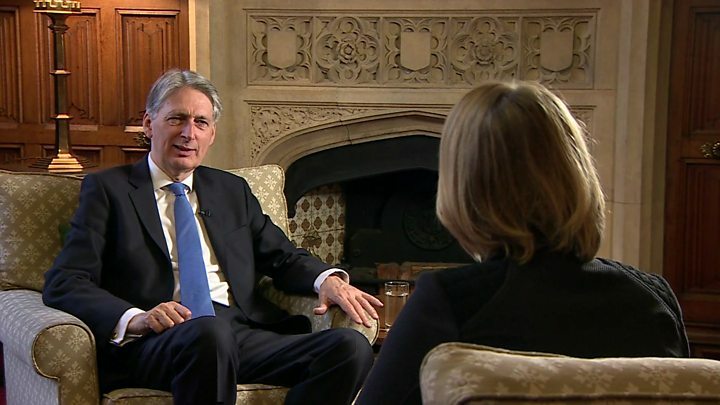 Mr Hammond told the BBC he had already committed to an extra £11bn in public spending this year and all chancellors "would like to have more money available to spend". Why is the chancellor so upbeat? Reality Check: Is the chancellor right that debt is shrinking? But with debt as a share of GDP due to start falling and the UK soon no longer having to borrow to fund day-to-day spending, he hinted he may have more room for manoeuvre. "I hope that the improvement in the public finances that was hinted at in today's OBR report, I hope that those will be carried through the autumn report and that will allow us to use some of that headroom at the autumn Budget to increase spending on our public services. "Of course that is what I would like to do if the public finances allow it." Shadow chancellor John McDonnell has accused Mr Hammond of "ignoring" the public services despite "a crisis on a scale we have never seen before". He said doctors, nurses, teachers, police officers and carers "can't wait" for the next Budget and wanted action after years of pay freezes and below inflation wage increases. But the Institute for Fiscal Studies said Mr Hammond faced a "sharp choice" on spending if he wanted to meet his target of eliminating the overall deficit, including capital expenditure, by the mid 2020s. Its director Paul Johnson suggested the economic backdrop was less rosy than Mr Hammond was suggesting, with growth forecasts for the next four years "dreadful" by historical standards.